The Exercise Handle Bar for 44″ Frames is specially designed for the JumpSport Fitness Trampoline. It provides increase stability and opens up a workout to new possibilities. It is flush-fitting and ultra-sturdy with 6 adjustable height settings (30″-40″ above the mat), a padded handle and wide legs for superior frame stability. One of our great mini trampoline accessories! 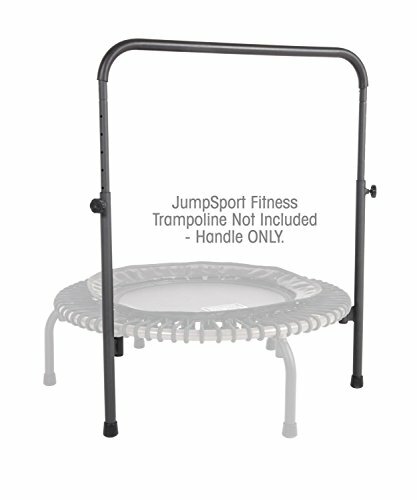 JumpSport Fitness Trampoline is NOT included. Made for 44" arched leg JumpSport Fitness Trampolines. Not compatible with straight or arched leg 39"JumpSport Fitness Trampolines or other brand rebounders. JumpSport is a small, USA, family-owned, 20-year-old business. Our founder, Mark Publicover, is the inventor of the trampoline safety enclosure that protects millions of bouncing kids around the world every day. JumpSport is the industry-leading innovator in trampolines. Feel good about buying the highest quality products available. What’s in the Box: 2 Handle Legs, 2 Side Handle Pieces, 1 Top Handle Bar with Foam, 1- 6mm Allen Wrench, and 2 Large Thumb Screws. Handle only. Fitness Trampoline sold separately.